The network is composed of experts in energy efficiency in order to remove market barriers for project implementation in European manufacturing industries. Provide skilled experts to find the best energy efficiency improvement solutions once the EMSA has collected the data. An Energy Angel is an entity that provides services related with energy efficiency to companies which have submitted to the EMSA web-tool. Who can become an Energy Angel? Be legally constituted as a legal person. Demonstrate experience working on energy efficiency related to the services provided. The EMSA tool support can only be provided after participating in a specific training session organised by the network. The EA network aims at supporting European manufacturing companies to assess, better know and manage their energy efficiency. All the Energy Angels are documented in an online database which is totally available via the EMSA web-tool web page. Companies will have free access to this database, and can search for an Energy Angel according to a number of sub-criteria (spoke language, country, type of company etc.). that will increase industrial energy efficiency in water processes across European countries. Increase your visibility to manufacturing companies. Through the Energy Angel Network, companies will have access to a dedicated database of energy efficiency experts. No participation costs during the project phase at least. Access to the EMSA web tool and training sessions will be free at least until the end of the project. So for now it’s free and being in the first subscribers will assure you maximum visibility among the companies using the EMSA web-tool. Build long-term commercial relationships by being automatically recommended to companies using the EMSA tool. Your work will be scored and validated, ensuring equal opportunities for all Energy Angels. The more you’ll get clients, the more visible you will be. Several training sessions were held through Europe to train new Energy Angel on the EMSA web-tool. They were complemented by webinars. What is the EnergyWater project? The EnergyWater project aims to provide support to manufacturing industries by enabling energy efficient water processing, through the development of the Energy Management Self-Assessment (EMSA) web-tool and the creation of an Energy Angels Network. We want to make energy efficiency something real for European companies. Funded by the European Commission (EASME), the EnergyWater project runs till 31/01/2019, with possibilities for end-of-project extensions. What is the EMSA web-tool? Benchmarking and ranking position with industrial companies by sector, size, country, etc. List of related Energy Angels with required knowledge. What is the Energy Angels Network? The network is composed of professionals working in the field of energy efficiency. The Energy Angels network improves the visibility of skilled energy auditors and energy managers as well as suppliers and funders for companies. It brings together expertise to facilitate the uptake of energy efficiency within industrial water processes. Energy Angels can advise companies on a range of topics from the use of the EMSA web-tool to the implementation of innovative energy efficiency solutions in manufacturing water processes. An online database which documents all the Energy Angels is available via the EMSA web-tool web page. Companies will have free access to this database, and can search for an Energy Angel according to a number of sub-criteria. Energy Angels are professionals with expertise and know-how in fields related to energy efficiency and industrial water processes. This includes: consultants (freelancers or companies), energy services providers and ESCOs, professionals working in the manufacturing sector, technology providers, and professional associations. The Energy Angel Network will provide its members with improved visibility, access to training material, and increased business opportunities. Energy Angels are required to sign-up to the Energy Angel Network database, an online European wide database that is freely available to industry, to access these benefits as well as the EMSA web-tool. 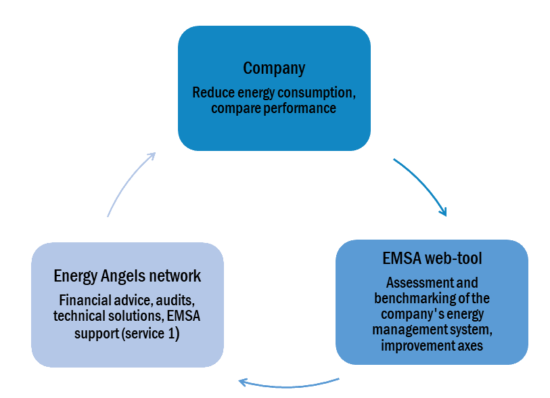 This user-friendly database helps companies choose Energy Angels that are able to support them with the use of the EMSA web-tool, the analyses of its results, the selection of best solutions, and implementation of solutions. What are the services that Energy Angels can provide to companies? When registering in the database, an Energy Angel selects the services he/she can provide to companies. This will help companies select the most appropriate Energy Angels according to their priorities Energy Angels are professionals with expertise and know-how in fields related to energy efficiency and industrial water processes. This includes: consultants (freelancers or companies), energy services providers and ESCOs, professionals working in the manufacturing sector, technology providers, and professional associations. To provide service 1, Energy Angels must follow a training session or a MOOC provided by the consortium. For each of the other services, this choice is reviewed by a partner of the EnergyWater project on the basis of the demonstrated experience of the Angel. The Energy Angel network is a dynamic network that provides opportunities to its members for career development. The list of services is not static and the Angel will be able to choose new services on the basis of . The partners of the project will help this process by giving advice on relevant external training sessions or certifications. 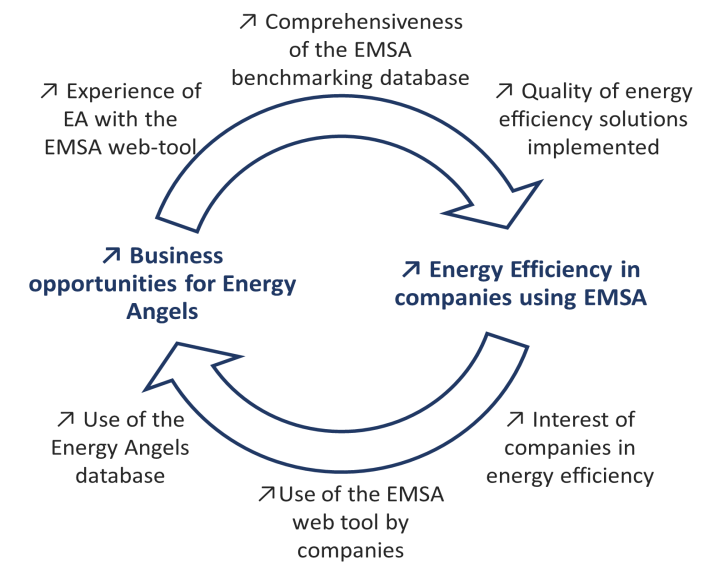 What are the steps taken by a company when interacting with the EMSA tool and Energy Angels? The EMSA Tool, an online and free anonymous tool, helps companies to identify their energy use across industrial water processes and benchmark their performance at the European level. Companies may require support from a professional to input data into the tool. Off the back of the results they could also seek professional advice to deep dive into potential solutions and subsequently, implementation support. For Energy Angels the tool provides an excellent avenue to start conversations with interested companies. At each step of the process, companies are free to contact an Energy Angel. An example case is described below. Energy Angels providing service 1 help companies to input data into the tool, check the quality of data before submission of data and can provide a first analysis of the different solutions given by the tool. This process may last from 1 day to 1 week. This first contact allows the Energy Angel providing service 1 to build a working relationship with the company. Step 2: Optional complementary audit to reinforce the analysis from the EMSA web-tool. If required, companies can use the database to choose an Energy Angel able to help them for this step. However, most of the time a company will choose a Energy Angel providing service 1 that can also provide any specific services they are interested in. What information can the companies see on an Energy Angel profile? Companies will contact an Energy Angel based on the information provided. How to become an Energy Angel? To become Energy Angels, applicants must sign up to the Energy Angel database at the following address: http://energywater-emsa.eu/index.php/angelsignup Energy Angels will be asked to provide basic information and to select the services that they wish to provide to companies. Energy Angels can decide to make their contact details public or not. A project partner of the EnergyWater consortium will review the application and the services that the Energy Angel wishes to provide. Where additional information is required one of the partners will reach out to the Energy Angel to discuss the application. The project partners reserve the right to deny non-suitable applications. 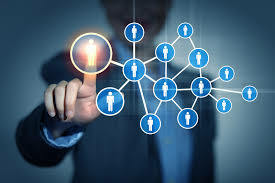 In such cases the decision will be explained and where applicable the applicant will be provided with a set of improvement actions that will need to be met in order to access the network. Professionals who are willing to become Energy Angels able to provide service 1 “EMSA web-tool support” have to follow a training session. On-site training sessions are being held from October thrrough to December 2017 in Europe. If the Energy Angel cannot attend one of the on-site training sessions, he/she will have the opportunity to sign up to on-line training sessions or MOOCS. What is the aim of the training session provided by the consortium for Energy Angels service 1 “EMSA web-tool support”? Training sessions are being held in 5 countries (UK, Spain, Belgium, Poland, and France) from October 2017 through to December 2017. The training sessions are free of charge. The on-site training session will last from 1 to 2 days according to the country in which it is held. What are the advantages of becoming an Energy Angel at the beginning of the project? In addition to the improved business and upskilling opportunities on offer to all Energy Angels there are clear benefits to be an early joiner. As the visibility of an Energy Angel’s profile is based on the Angel’s previous experience and company ratings, being involved as an Energy Angel early in the project will result in a more noticeable profile and improved long term business opportunities. You will benefit from the support of the EnergyWater project partners. The training sessions to become an Energy Angel providing service 1 are free during the project period. I am an energy manager in a company, can I become part of the EA network? Energy responsible can become Energy Angels, giving them access to the EMSA web tool, sectorial information, and upskilling opportunities. This will position you to better service your company in energy efficiency across industrial water processes. When joining the network you will be able to choose whether or not to make your contact information public in the database. If you want to provide the service 1 “EMSA web-tool support” to your company, we strongly suggest that you attend a dedicated training session so that you are able to provide an optimal service to your company. Being considered as an Energy Angel is a way to gain visibility in your company and have a direct access to energy experts that are able to help you on specific topics. I have little professional experience in the energy efficiency domain but I want to be part of the network. The Energy Angel network is a dynamic network that will provide opportunities to its members for career development. The list of seven services you choose to provide to companies is not static and you will be able to choose new services on the basis of new professional experience, certifications or professional training. The project partners will help this process by giving advice on relevant training sessions or certifications. So if you are looking to increase your professional development, we can help you to develop expertise and give you the opportunity to be involved in the network. Further information concerning the EAN: download the Energy Angels User Manual!